It’s official. The Japan Rail Pass is valid for travel on the new JR East Hayabusa shinkansen service! The Hayabusa totally opens up the Tohoku and Hokkaido areas of north and north east Japan. Previously, travel as far up as Aomori had needed the use of the slower trains, but starting from early March 2011, the Hayabusa Shinkansen will whisk you from Tokyo to Shin-Aomori in 3 hours 10 minutes. The great news is that the Japan Rail Pass is valid for this route! Gran Class: use is subject to the full express fare, and the Gran Class full fare. There is no upgrade path at this time from either green car or standard Japan Rail Pass. If you want to travel on the Hayabusa, you must have a seat reservation, so make sure you go to the JR Ticket Reservation Counter before boarding! Reservations are free for Japan Rail Pass holders. The 10-car train sets of Shinkansen Series E5 are used for this train. 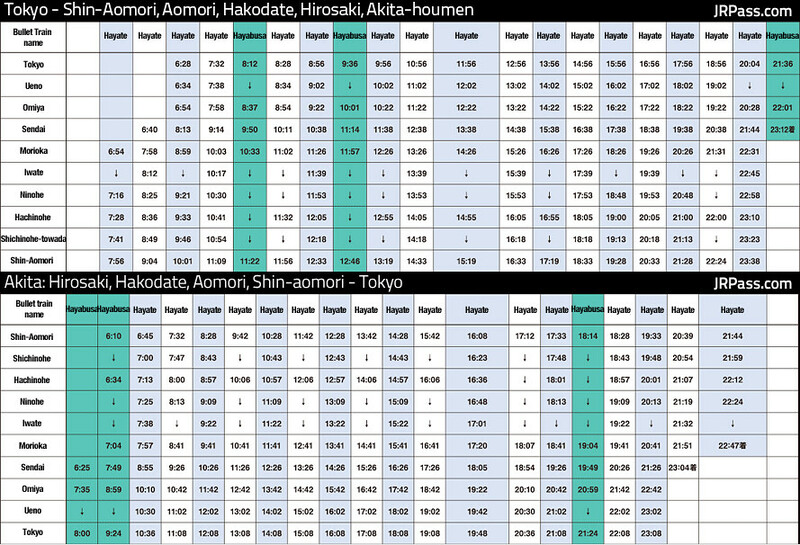 Initially the numbers of this train will be limited to 2 services between Tokyo and Shin-Aomori each way and 1 Hayabusa service between Tokyo and Sendai stopping at Omiya, Sendai and Morioka along the way. Certain Hayabusa services also stop at Hachinohe. The Hayabusa is the first in a new line of High Speed Shinkansen Bullet trains which will hit a maximum speed of 300km/h, rising to 320km/h in 2013. What is this Gran Class? With the Hayabusa, JR East have introduced an additional premium class car, called the Gran Class This car is the height of luxury, and can be likened to the top class cabins on an airline, with huge leather seats and top class waiting staff. The cabin attendant serves a complimentary meal, alcohol and soft drinks. A blanket, slippers and eye-shades are also provided. If you really want to travel in style, then this is the way to do it. Is Gran Class worth the price? As it’s a brand new train, all the seat classes are incredibly comfortable and spacious, with power points available even in Normal Class seats. Given the choice, we’d probably save our money on the Gran Class for an incredible meal on arrival at Aomori, but it’s nice to have the option! Hayabusa video showing the awesome speed! Is there an English Hayabusa Timetable available online? There’s nothing online yet, and Hyperdia still hasn’t been updated so we have prepared a translation of the Japanese Timetable. Not just north Japan opening up in 2011, but south Japan too! 2011 also brings the new Sakura and Mizuho lines to the JR-West/Kyushu network, opening up high speed shinkansen bullet train travel from Osaka all the way down to Kagoshima (and it’s wonderful onsen and coastlines) in Kyushu. The JR-West and JR-Kyushu Sakura Shinkansen trains are also valid for Japan Rail Pass holders!, you can learn more about them in our latest blog post!